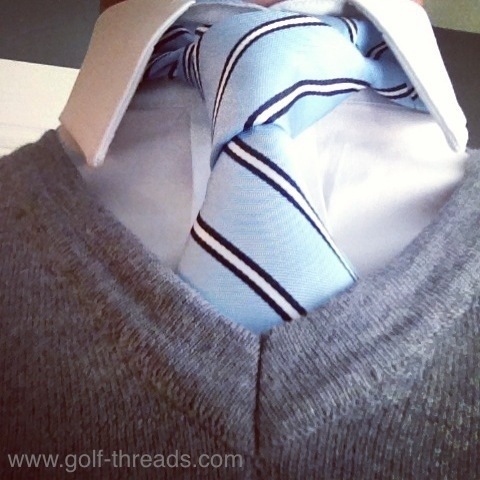 Vesti Ascendi: A Dress Shirt & Tie for Golf? I have to admit, when the folks at Vesti Ascendi first approached me about reviewing their dress shirt and tie, I had to triple check that it wasn’t April Fool’s Day. Really??? 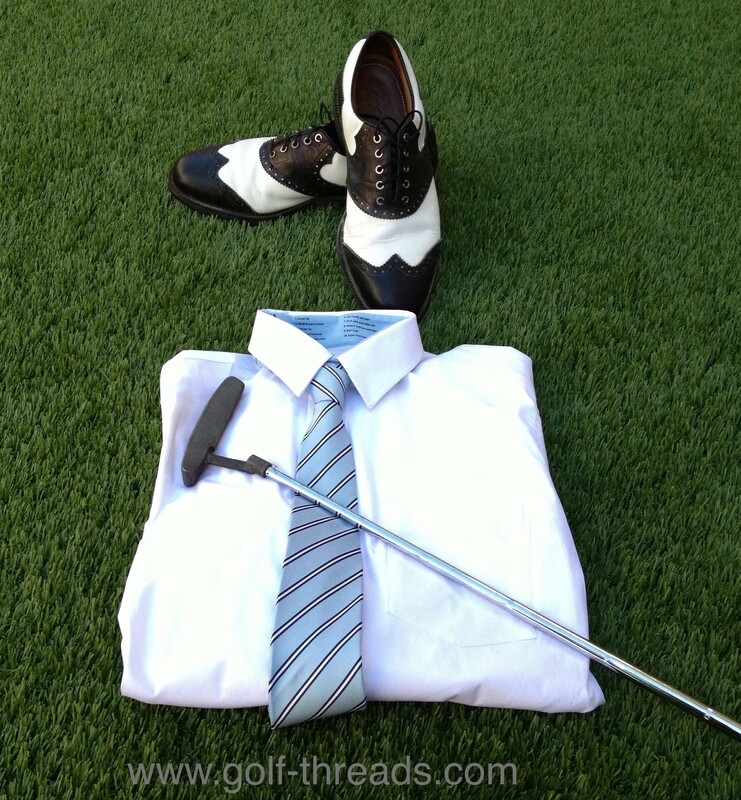 A dress shirt and tie for golf??? I was skeptical as I had been down this road before. When Ryan Moore channeled Bobby Jones at the Masters a few years ago by donning a shirt and tie, I needed to give it a try. After entering the deep, dark depths of my closet, I managed to find a tie, dust it off and hit the range. Needless to say, after hitting less than a dozen balls, I declared the ‘RyMo’ experiment an epic fail. I couldn’t even hit a full wedge without feeling like I was in a strait jacket and the tie was constantly in my way. Putting wasn’t much better either as every jerky movement of my stroke was exaggerated by the tie moving in a million different directions. That being said, the more I talked with the Vesti Ascendi crew, the more intrigued I became with their concept. This wasn’t a gimmick or novelty. Very specific golf features were being designed into their shirts and ties to maximize comfort and playability on the course. Plus, ties are back in vogue now. Open any GQ and you’ll see ties paired with everything from suits to denim to bright-colored chinos. Business casual has grown up. It would be easy to look at the shirt and tie sets from Vesti Ascendi and think that this is just another example of golf’s recent retro movement. 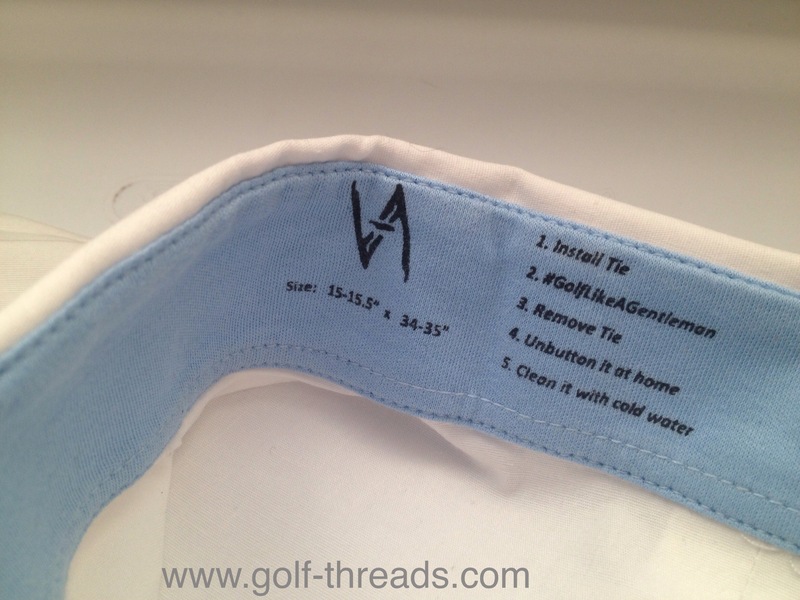 While this may be partially correct, the idea behind Vesti Ascendi is one that I’ve discussed a lot on this blog — versatile, stylish golf apparel that transitions with you throughout your daily activities. While other brands have accomplished this through a casual street wear vibe, Vesti Ascendi has taken a more refined approach with elegant-looking shirts and ties. Each of the shirts and ties from Vesti Ascendi’s are sold as a coordinating set making it impossible not to look good. 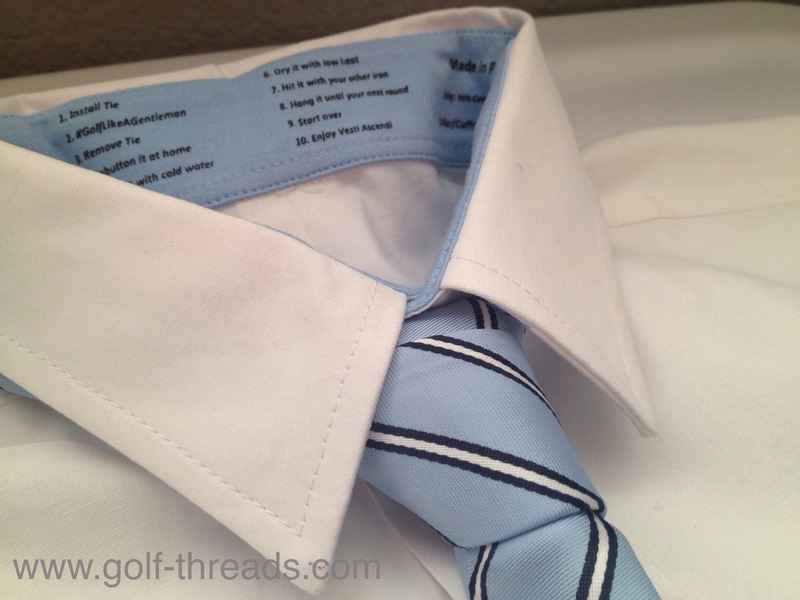 The 1st Tee Jitters shirt and tie that I received for this review features a brilliant white dress shirt and a light blue tie with a preppy diagonal stripe pattern. Additional looks from Vesti Ascendi include the Mulligan (a light blue shirt paired with a Burberry-like plaid tie) and the limited edition FourSome (a cool grey shirt paired with a black and silver paisley tie). Although the 1st Tee Jitters shirt is fairly basic, it earns serious style points for its modern design. The short, slightly spread collar and the slim fit is on-trend. 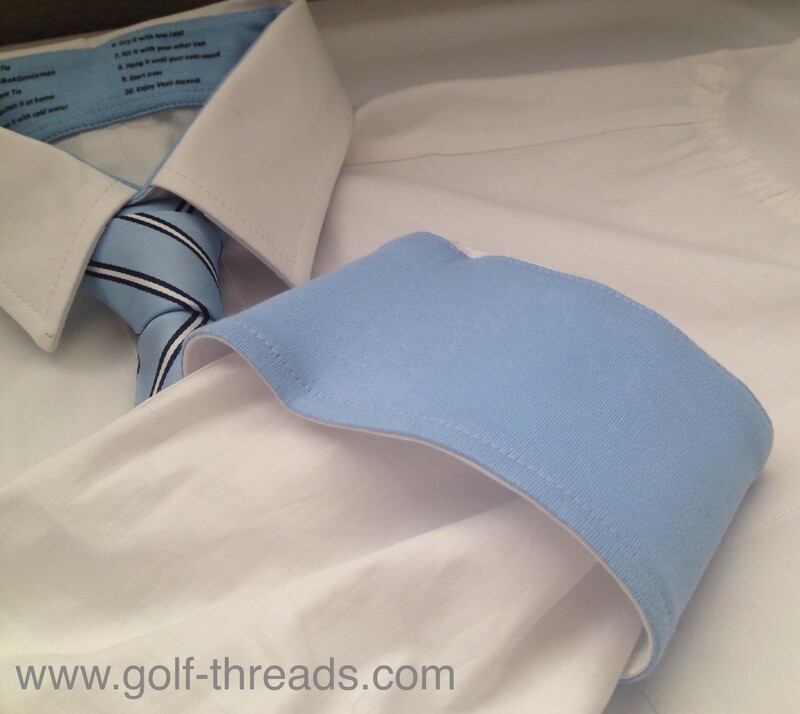 The light blue retention strap sewn into each sleeve provides a perfect complement to the light blue tie when the sleeves are rolled up during a round. Also, no logos are visible when the shirt is being worn. Although this makes me cringe as a marketing professional, it allows for a clean, refreshing look. Like most dress shirts, the ones from Vesti Ascendi are sized by neck circumference and sleeve length. I found the sleeve length to be true to size and the neck to run a touch small (not to the point of being uncomfortable, though). If you are between neck sizes, I’d recommend sizing up, especially since there are two top buttons (shown above). This is nice feature that allows you to adjust the neck size by a half-inch here or there. How comfortable is the Vesti Ascendi shirt and tie on the course? Well, after about three holes, I didn’t give much thought to the fact that I was wearing a shirt and tie. It felt just like a regular round in a polo shirt. That actually says a lot about the comfort and playability of the apparel. The shirt itself is constructed of a 95/5 cotton/spandex blend. That touch of spandex combined with the clever expansion pleat in the back allows you to squeeze those few extra yards out of the driver, while maintaining the slim, modern fit. 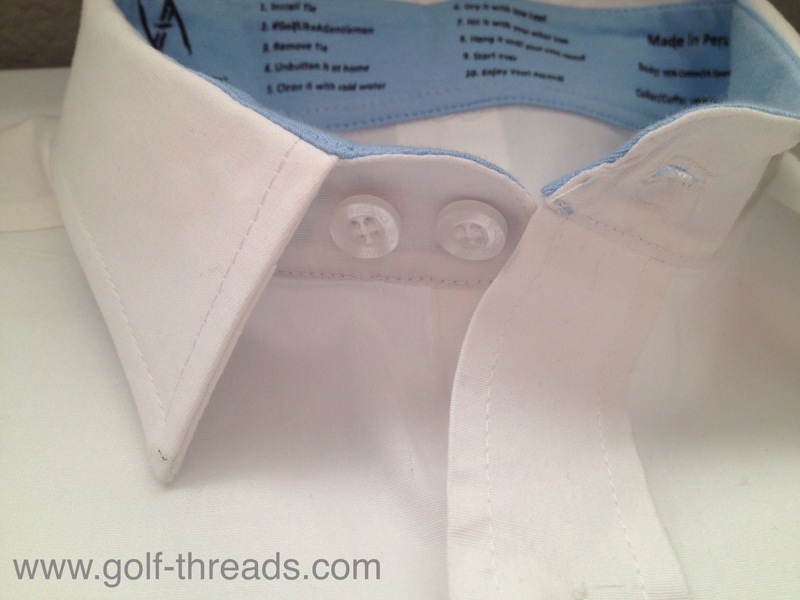 The pima cotton on the inside of the collar and cuffs (shown above) is incredibly soft and comfortable. Typically, after wearing a tie for a few hours, my neck looks like I lost a fight to a cheese grater, but the pima cotton lining on the Vesti Ascendi collar felt like a soft blanket throughout the round. I’d wear ties more often if I could find shirts with collars like this. While the Vesti Ascendi shirt and tie is comfortable and provides a sophisticated look, it is probably best reserved for rounds during the fall, winter and spring. I was quite comfortable on a 60 degree day, but there will be times of the year when hitting the links in a shirt and tie is just not practical. 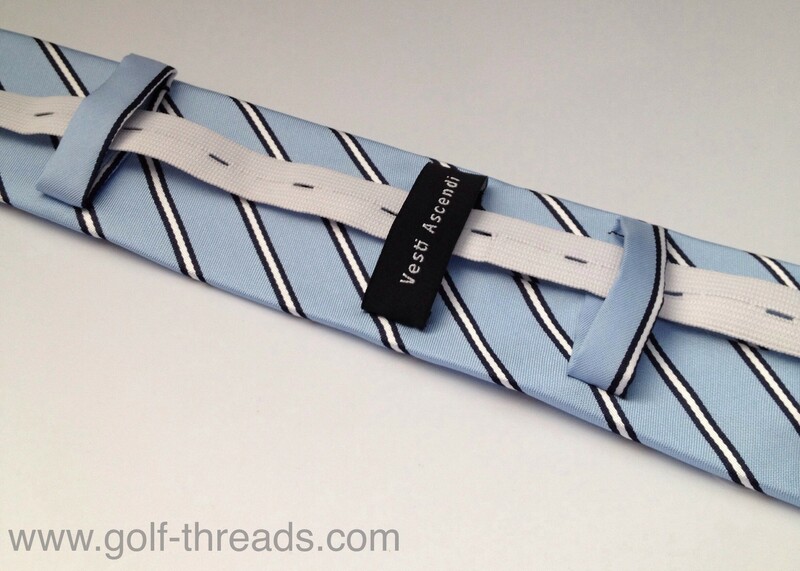 Of all the golf-specific features designed into the Vesti Ascendi shirts, the tie rail (shown above) is probably the most important in making it possible to rock a tie on the course. The tie rail is brilliant in its simplicity. It’s one of those things you see and wonder why you never thought of it. This thin strip of fabric with multiple button holes slides through the loops on the back of the tie. Simply button the shirt to the tie rail and the tie stays close to your body and out of your way, no matter what shot you are playing. In addition to the shirts and ties, Vesti Ascendi offers two varieties of hats and belts to help you complete the throwback look. Both the black twill herringbone driver hat and glen plaid baseball-style cap are great complements to the shirts and ties. The belt options consist of a sharp-looking black leather belt with blue stitching, which pairs well with the 1st Tee Jitters and Mulligan looks, and an eye-popping lime green crocodile belt that adds a touch of color to the FourSome ensemble. Both of the belts and two branded buckles were made exclusively for Vesti Ascendi by custom leather goods company, Jacob Hill. Completing the look below the waist may require some adjustments to your golf wardrobe, especially if you mostly own technical pants and sporty shoes. Expect some high-quality trousers from Vesti Ascendi in the future, but in the meantime, I suggest pairing the shirt and tie with well-tailored wool pants, such as these from J.Lindeberg. As far as shoes, I love my True Linkswear Tours, but they just won’t work with this look. Instead, consider a pair of classic Foot Joy Icons (shown above) or Ecco Tour Hybrids for a spikeless option. After playing this game for 30 years, it was fun to do something that I’ve never done before — play in a shirt and tie. The shirt and tie sets from Vesti Ascendi are stylish, comfortable and very playable (in fact my score while wearing Vesti Ascendi was a few strokes lower than my average for the year). While I can’t say this will be a regular look for me on the course, it is perfect for office outings, quick nines during the week and a few special rounds throughout the year. This is an elegant way to stand out on the course without giving in to the world of garish patterns and neon colors. It also makes a great gift for that golfer who has everything. Vesti Ascendi shirt and tie sets are available on VestiAscendi.com for $125 at the time of this post — a very fair price considering you get a stylish, versatile shirt and matching tie that can be worn to play golf for a lower price than most of the dress shirts at Nordstrom. You can also connect with Vesti Ascendi on Twitter, Facebook and Instagram. Previous PostWho Has the Best Apparel Deal on the PGA Tour? James Driscoll, Of Course. Perfect shoes for the out-fit. Somehow I don’t think a pair of Puma’s would look quite right.